Please join MNAPABA for our second quarter Regional Small Group Lunch! Register for the location you would like to join us for lunch. You will receive an e-mail from your regional captain with further details a week in advance. Please contact Sukanya Momsen with questions at Sukanya.Momsen@BestBuy.com. 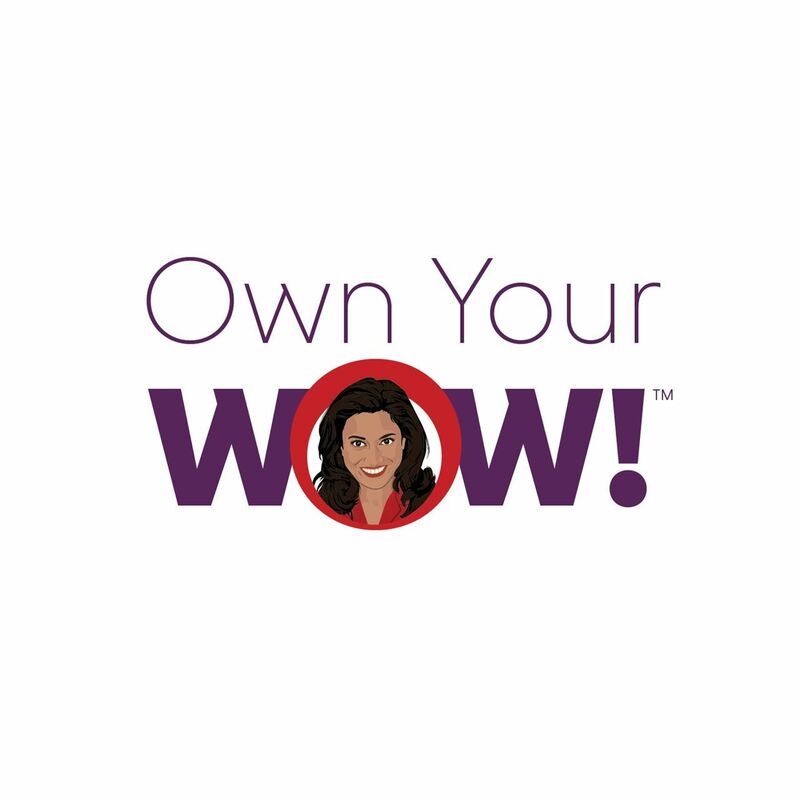 Please contact Linhda Nguyen (linhda.nguyen@uhg.com) or Caren Seenauth (Caren.Seenauth@bestbuy.com) with questions. If you plan to attend the meeting, in addition to registering, please contact Alex Dyste-Demet at Dysteale@gmail.com to let her know you're attending. NAPABA Lobby Day 2019 - Stipend Available! 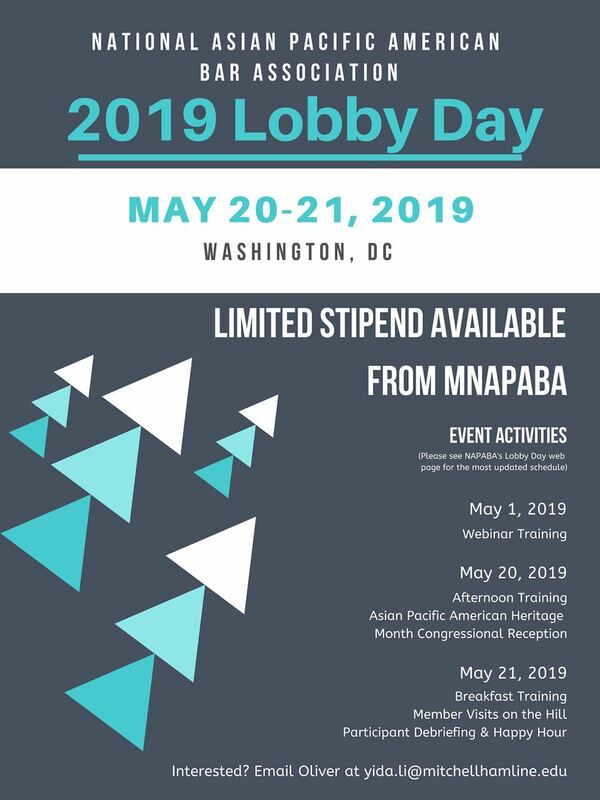 MNAPABA has a limited stipend available to assist members in attending NAPABA Lobby Day in Washington, D.C. Stipends are only available to first-time recipients of MNAPABA stipends to the Lobby Day event. Two qualified applicants will each receive a $500 stipend. 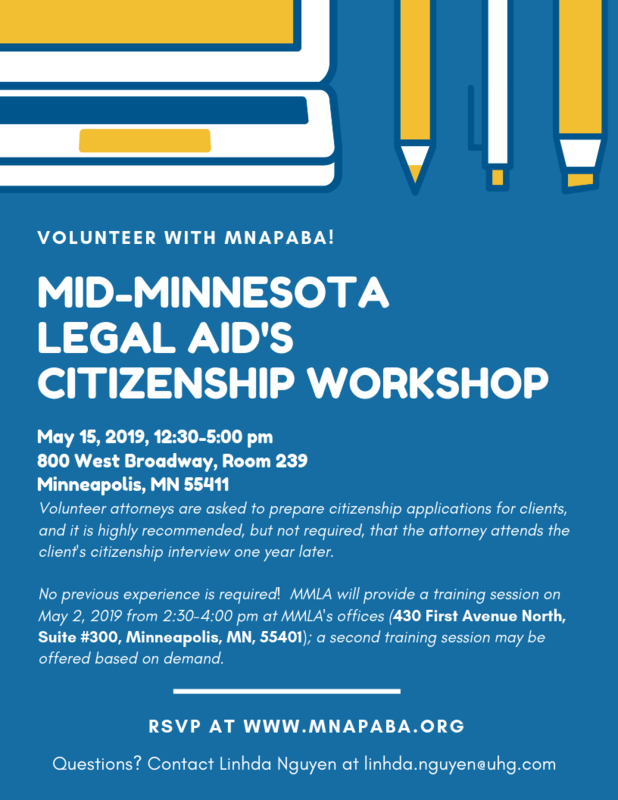 Please e-mail Oliver at yida.li@mitchellhamline.edu your interest in attendance by March 15 at 11:59 pm to be considered for a MNAPABA stipend. If you plan to attend the meeting, in addition to registering, please contact Vince Pham (vincelpham@gmail.com) and Alex Dyste-Demet (Dysteale@gmail.com) to let them know you're attending. Wed, March 27, 2019 Baking Cookies with Cookie Cart! Sat, February 23, 2019 MNAPABA Karaoke Night! Wed, September 12, 2018 2018 Annual Gala: "Shipbuilding: Friendships, Mentorships, and Sponsorships"
Sat, November 04, 2017 Minnesota Get together @ NAPABA Convention | Washington, D.C.
Thu, November 02, 2017 Central Region Reception @ NAPABA Convention | Washington, D.C.
Thu, October 12, 2017 Economic Espionage & National Security: Bias in The Criminal Justice System? Tue, June 06, 2017 How to Be An Effective Summer Intern (Panel and Mixer) - Registration Now Closed. Sat, February 20, 2016 A Mu Performing Arts production YOU FOR ME FOR YOU! Sat, February 06, 2016 TCDIP 1L Boot Camp "So You Got Your Grades, Now What?" 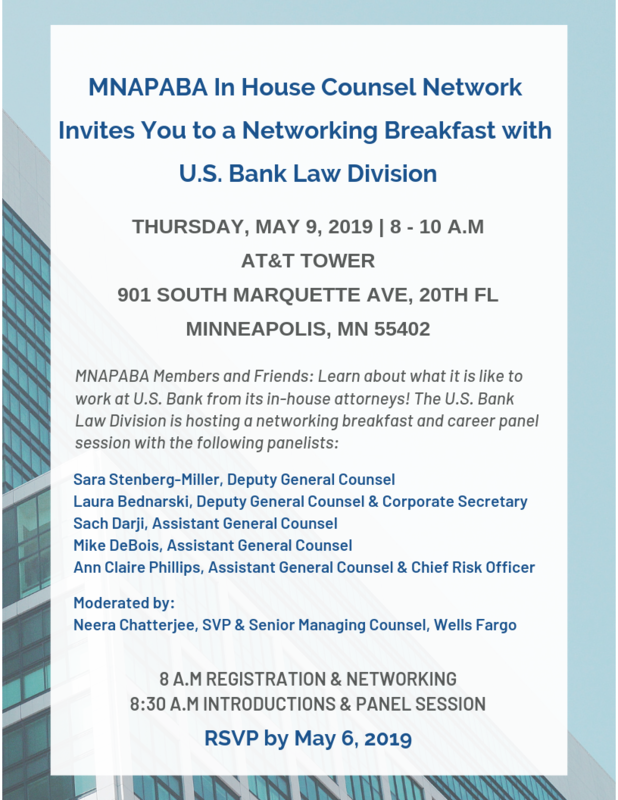 MNAPABA members can expect to benefit personally from involvement through being a part of a diverse community of APA attorneys excited about building mutually beneficial relationships and fostering professional development and skill-building. MNAPABA enables many of these opportunities through a host of unique events each year. Check back here often for a calendar of our latest upcoming events.